A sci-fi thriller set in a Chicago neighborhood nearly a decade after it has been occupied by an extraterrestrial force. Captive State release date was Friday, March 15, 2019. This was a Nationwide in theaters release. 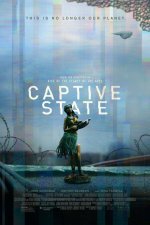 Captive State uses a grounded sci-fi setting to shine light on the modern surveillance state and the threats to civil liberties and the role of dissent within an authoritarian society (Participant Media, 1/11/17).